Suzy loves challenging herself and inspiring others. Her story is a combination of daring to dream and strategic planning. As a junior international tennis player she learnt that success demands hard graft, organisation and doing what you love. In the last five years she has turned a fanciful dream of climbing, skiing and surviving above 8000m in the 'death zone' into reality. Whilst hundreds of people have summitted Everest, fewer than 15 people have ever climbed and skied this high. And survived. Skiing this high is both groundbreaking and body breaking and has turned Suzy into a record breaker. Her passion for skiing developed after two seasons working in the Alps (one when she was supposed to be studying for her Psychology degree in Italy). After graduating, her job tour guiding around the World allowed her to use her five languages and gave her plenty of free time to enjoy snowy winters. She now uses her Skiing/Psychology degree as a motivational speaker and life coach. When not working, if she is not running or mountain biking, she is out on the water with a kite or windsurf. In the last few years, as well as UK adventure races, she has run the gruelling 150 mile Marathon of the Sands in the Sahara desert, made the international selections for the Fulda 2006 Arctic Challenge and was the UK's first female finalist in the 2006 Landrover G4 Challenge. In 2003 Suzy smashed her collarbone kitesurfing and could do no sport other than walk for 6 months, so she decided to walk up Kilimanjaro (highest mountain in Africa 5900m) to prevent herself from going bonkers with boredom. In 2004 she and her friends created the 'lipstickblondes', an all female adventure racing team, when she realised that all other teams were male dominated. 7000m Aconcagua (highest mountain in South America ) followed the same year, and it was whilst shambling down the slippery scree that the 5-year plan of skiing big mountains was born. With little technical climbing experience she methodically set out to gain skills and experience higher altitudes. To build knowledge she climbed and skied one mountain a year: Elbrus (highest mountain in Europe 5600m), Denali (highest mountain in North America 6200m), Mustagata (China 7500m) and finally, on October 2nd 2008 achieved her dream of skiing from the summit of Cho Oyu. At 8201m it is the 6th highest mountain in the World. 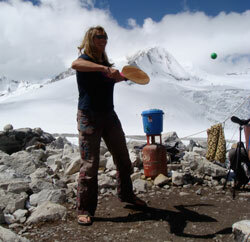 Suzy is the first British woman to ski this high.